Within the project PiNA prepared the first of a series of short video presentations of Slovenian good practices in the field of green entrepreneurship. 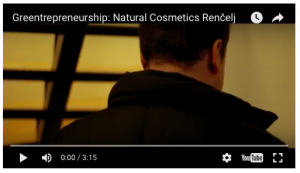 The first video shows the path of philosophy of Renčelj Family business company from Povir village, Slovenia, which main activity is lavender production and other lavender products-cosmetics, tea, spices, liquor. It won`t be wise to start the story of Renčelj company (pronounced »Renchel« in Slovenian) without the story of his owner and creator, Gregor. As a child, he loved to play in the nature where wild lavender grows and this sensation, the parfume, never leaved him. So, some years later, he decided to make of his passion and transform this sensation to a business adventure and became one of the first lavender producers in Slovenia. Today, after 5 years of developping the business Renčelj company is in very good position to start earning a profit and have benefits for the first time from the beggining of the adventure. The company is not officially labelized ˝bio˝ but according to its owner ˝Our lavender fields in the heart of nature˝ are not ˝subject to any chemical influences˝. What is one of the forces of the company, it is the natural, clean process of production.